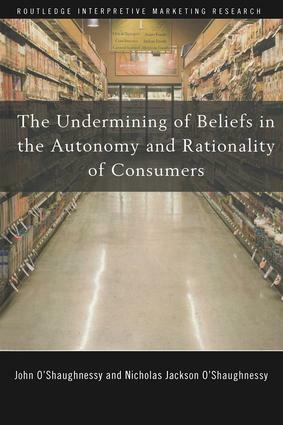 This book examines modern consumption, focusing on concepts of autonomy and rationality. In recent years, conventional ideas of 'free will' have come under attack in the context of consumer choice and similarly, postmodernists have sabotaged the very notion of consumer rationality. O’Shaughnessy and O'Shaughnessy adopt a moderating perspective, reviewing and critiquing these attacks in order to work towards a more nuanced view of the consumer: neither entirely autonomous nor perfectly rational. While the first part of this book concentrates on assailing critiques of 'free-will', the second part takes issue with the postmodernist emphasis on the non-rational. The authors situate these critiques in the context of key academic debate, examining the logic and empirical bases for their claims thus leading to a deeper understanding of 'bounded' rationality and the potential of the adaptive unconscious to affect consumer choice. John O’Shaughnessy is Emeritus Professor of Business at the Graduate School of Business, Columbia University, New York. Nicholas O’Shaughnessy is Professor of Marketing and Communications at Queen Mary, University of London.